This is part of Scotland’s commitment to the Paris Agreement, which aims to “strengthen the global response to the threat of climate change” by keeping Earth’s temperature below 2˚C, pushing it even further to 1.5˚C. Scotland want to show the world that they are committed to this cause. In terms of how much is done domestically to reduce emissions, there is the option of paying other countries to act on Scotland’s behalf through international carbon offset credits. Scotland also includes a fair share of emissions from international aviation and shipping and removing this would help reach that net-zero target. Technology can be both a godsend and hindrance in achieving the bill’s goal. Using carbon capture and storage, energy can be generated without emitting large amounts of greenhouse gases into the atmosphere. Bioenergy is even better is it removes any gas from the atmosphere. However, it needs to be implemented by 2030 to reach the bill’s target. To reduce greenhouse gas emissions created from producing food, it requires alternative farming practices, and research into the role of genetics and feed additives. but this could have a knock-on effect on Scotland’s food and drink industry if we drastically reduced the amount of emissions. Transport is a big contributor to CO2 emissions, and there are ways in which everyone can help reduce them. 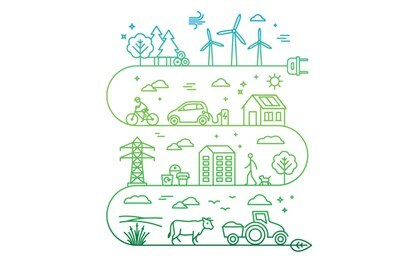 The government aims to “remove the need for petrol or diesel powered vehicles by 2032 is the first step in achieving the almost complete decarbonisation of road transport by 2050.” But with half of miles driven in Scotland driven in rural roads, meeting this target before the cost of technology goes down, could hit rural areas the most by raising the costs of goods and services. Businesses could be potentially affected by these targets. By aiming for over 90%, some places might not have the resources needed to achieve that goal, and may relocate to other countries with less ambitious climate change plans. There are incentives, however, which aim to help businesses become greener. With the help of EU funding and Zero Waste Scotland, the Scottish Government plan to provide £18 million to support manufacturing businesses to become a circular economy which is more sustainable and eliminates waste. Materials, for example, are kept in a high value state for as long as possible. How will the bill affect you? There’s a lot to think about with the new Climate Change bill, and although there are some setbacks to consider, a net-zero target could be achieved if we work together and make use of the exciting technology at our disposal. The Environment, Climate Change and Land Reform Committee (ECCLR) want to hear from the public about what they think of the bill and how they may be affected by its policies. On Monday 24th September, 6pm – 8pm (Refreshments 5.30pm) they are holding a community event at New Volunteer House in Kirkcaldy, which Greener Kirkcaldy are supporting. If you want to know more about the bill and want your say, you can book a place.